CELTIC HAVE ANNOUNCED the signing of RB Leipzig defender Marvin Compper. The 32-year-old has signed a two-and-a-half-year contract with the Scottish champions and will officially join up with the squad when the transfer window opens in January. “The last half-a-year, I wasn’t playing so much at Leipzig,” he told CelticTV after finalising the deal. 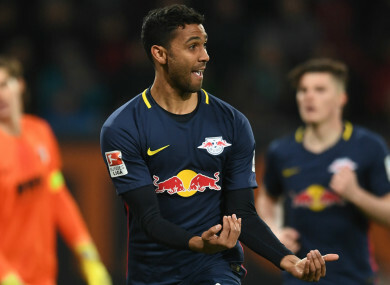 The centre-back, who started his senior career with Borussia Monchengladbach, joined Leipzig in 2014 after spending a season with Fiorentina. He played 25 times in the Bundesliga last season as Leipzig finished runners-up to Bayern Munich, but has found his role limited in 2017-18, managing just two appearances in the league and one in the Champions League. The defender has earned one cap for his country, becoming the first Hoffenheim player to be capped for Germany when he made his international debut in a 2-1 friendly defeat to England in 2008. Email “Celtic snap up experienced German defender from RB Leipzig”. Feedback on “Celtic snap up experienced German defender from RB Leipzig”.